This innovative HDMI audio processor is a great digital audio decoder/converter solution for decoding uncompressed digital LPCM 7.1 or 5.1 channel sound into analog surround format for existing analog amplifier or receiver. It can also extract those compressed Bitstream audio such as Dolby Digital, AC3 and DTS 5.1 through its optical audio output for further decoding by your A/V receiver. 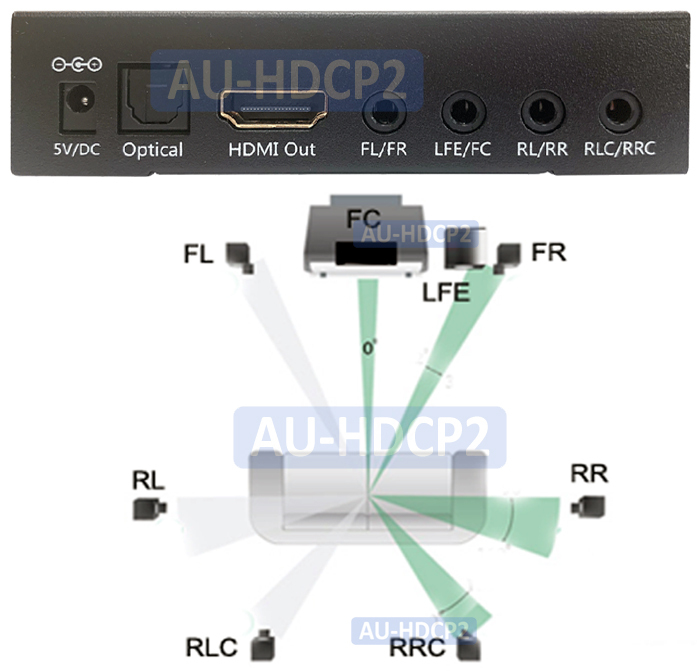 This HDMI processor supports direct pass-through of all HDMI 3D video and deep color content. The HDMI input supports resolutions up to 4Kx2K. This device has an internal repeater function built in to make sure its HDMI output will pass the same sharp detailed images with original digital audio sound maintained all the way to the display or the receiver end. The operation of this HDMI audio processor does not require HDMI hookup with a TV. 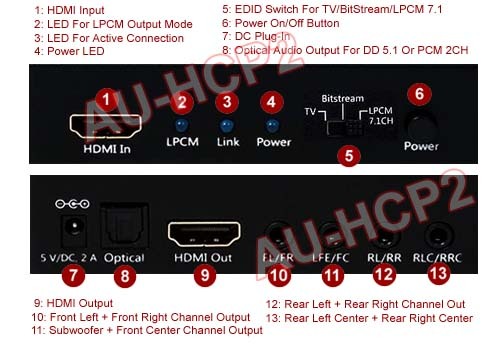 The analog audio output or optical audio output from the device remains coming through when the HDMI output of this device is not connected with a TV. TV Mode: Switch to TV mode for the HDMI source to output audio according to what the TV or AV receiver can support. 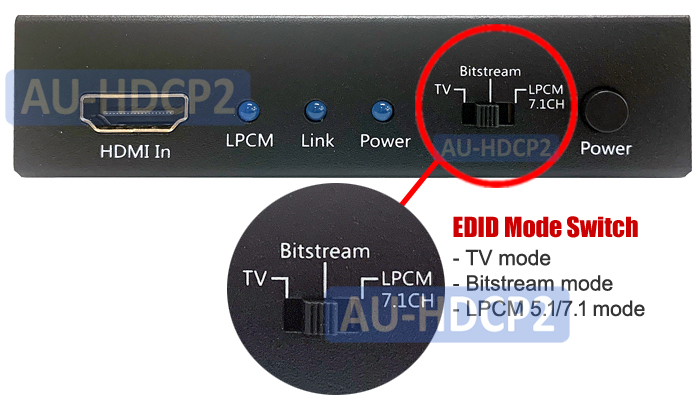 Bitstream Mode: HDMI source will output bit-stream audio such as AC3, Dolby 5.1, DTS 5.1, which will be extracted and routed through its optical audio output. LPCM 7.1CH Mode: all 3.5mm audio ports output LPCM 7.1CH sound. Optical port output 2 channel PCM digital audio. [Note]: Depending on the input audio format, the unit may not output audio through all output port. For Example, the optical output port will have no audio when the input audio format is more than LPCM 7.1CH. 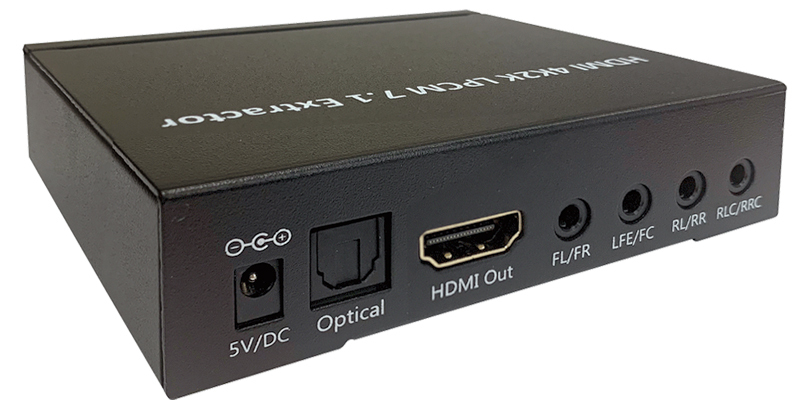 This HDMI audio decoder is a great device for decoding the LPCM 5.1 and 7.1 surround sound output from devices such as PS4, Wii U, Blue-ray player, etc into 7.1 and 5.1 discrete channel sound through its front left/right, center/subwoofer, rear left/right and rear center left/right ports to deliver a directional and more realistic effect. Source player and DVD disc must have the capability of providing multi-channel audio output for this process. The decoded analog audio output from this device produces an accurate duplicate of sound which is bit-for-bit identical to the studio master, so listening at home is the ultimate home cinema experience. 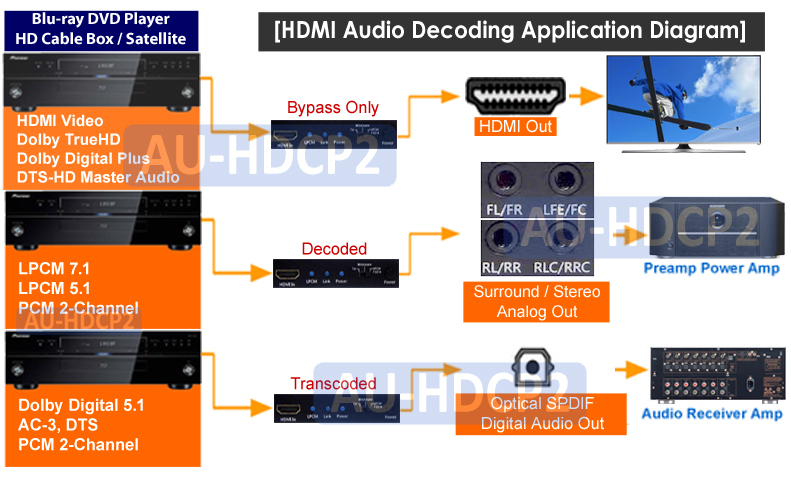 [Note]: Dolby TrueHD or DTS-HD Master Audio can only passed through the HDMI output with no decoding and no conversion. This HDMI audio converter can extract the compressed Dolby Digital, AC3 and DTS 5.1 and route through its optical audio out. Source player and DVD disc must have the capability of providing multi-channel audio output for this process. [Note]: The optical output port will have no audio when the input audio format is LPCM 7.1 or 5.1CH. 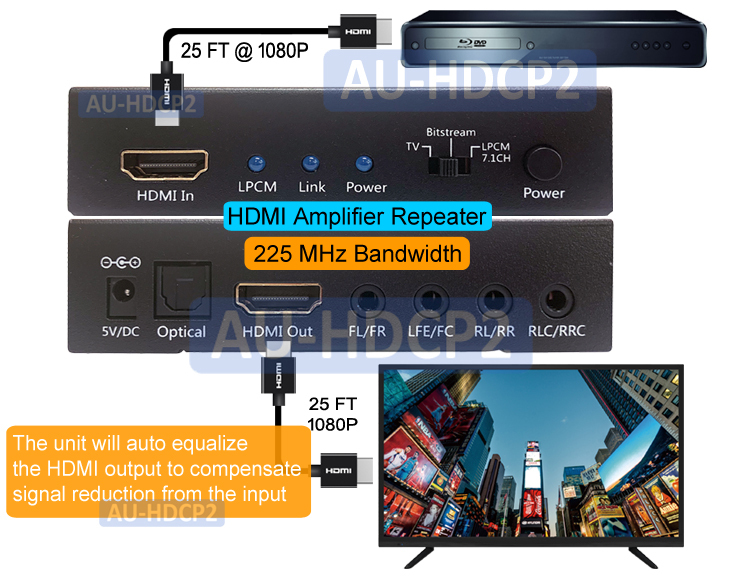 This HDMI audio processor has repeater built in which can automatically equalizes and compensates for HDMI signal loss during the cable run and also extends the cable reach to maximum distance with the same signal quality maintained all the way and delivered to the end HD display. This device is fully complaint with the new HDMI 1.3 and HDCP 1.2 standard. It also supports 12-bit per channel (36-bit all channel) deep color, 3D and HDMI CEC (Consumer Electronics Control) bypass. Great digital to analog audio decoder solution for transcoding uncompressed digital LPCM 7.1 or 5.1 channel sound into analog surround format for existing analog amplifier or receiver. Extract compressed digital Bitstream audio such as Dolby Digital, AC3 and DTS 5.1/7.1 embedded in HDMI feed and output through its optical audio output for further decoding by downstream device. Supports uncompressed LPCM 7.1, LPCM 5.1 and PCM in analog output through the multi-channel 3.5 output ports. Supports compressed audio such as Dolby Digital, AC3, DTS 5.1 and PCM 2CH through optical audio output. Easy EDID dip switch selection so users can easily control their HDMI source to send the desired digital audio format for decoding or conversion. No HDMI output with TV is required when receiving audio at the analog or optical audio output. Supports all HDTV resolutions including 4K, 2K, 1080p, 1080i, 720p, 576p and 480p. Output resolution follows input. Fully compliant with HDMI 1.3, HDCP 1.2 and DVI 1.1 standards. Supports HDMI audio sampling rates up to 192 kHz. Supports optical (S/PDIF) digital audio sampling rates up to 192 kHz. Its built-in repeater function helps devices regenerate and equalize the HDMI output signal to be same with sharp detailed images with original audio sound quality. Supports 12-bit per channel (36-bit all channel) deep color and 3D . Supports HDMI CEC (Consumer Electronics Control) bypass.